In the run-up to Singapore’s recent general elections, the victory of the People’s Action Party (PAP) – which has presided over transformational social and economic development throughout its continuous five-decade rule – was a forgone conclusion. The question on people’s minds was rather, to what extent could opposition parties dent the ruling party’s dominance and gain a foothold in Parliament? 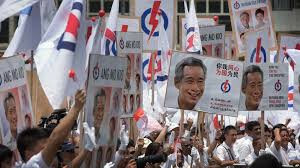 Tens of thousands attended rallies organized by opposition parties during the campaign period, leading many to believe that opposition candidates would steadily gain more ground after the ruling PAP suffered its worst electoral performance in history during the last election cycle in 2011. Contrary to predictions of a watershed election, the PAP secured huge margins, claiming nearly 70 percent of the popular vote in a spectacular rebound. 2015’s elections were presented as an “unprecedented” challenge to Singapore’s ruling party in the international media. On the ground, the sense of a growing momentum for left-leaning opposition parties like the Worker’s Party (WP) and the Singapore Democratic Party (SDP) and other largely untested parties could be felt. Even government-friendly state media devoted front page coverage to well-attended opposition rallies. Despite projections and popular sentiments that suggested a real possibility for opposition parties to capture a larger share of the vote, opposition parties instead saw their share of the vote plummet in 2015 by as much as 16 percent from 2011, with no headway made. How then, in the current political landscape, should the PAP’s stunning resurgence be accounted for? Perennial ”bread and butter” issues remain at the heart of electoral politics in Singapore, one of the world’s most expensive countries. As a small city-state with a limited domestic market and no natural resources, Singapore has shaped itself into a global financial center and a major hub for maritime services, oil trading, and electronics manufacturing by harnessing a growth model built around liberal immigration and foreign direct investment policies. Singapore citizens currently make up 61 percent of the country’s 5.47 million people, and the influx of recent migrants has given rise to overcrowding, rising living and property costs, and a widening income disparity. Singapore’s government is relying on immigration to offset declining birth rates, with an expected increase in population to 6.5 million or even 6.9 million by 2030, of which 45 percent will be foreigners. The rising tide of immigration remains a contentious issue in Singapore, as migrants are blamed for fuelling inflation, depressing wages, and taking jobs: not only low-paying positions but also middle and high-paying professions. The PAP’s poor performance in the 2011 polls can be attributed to opposition parties’ tapping into public disillusionment over foreign labor competition while positioning themselves as a check on the ruling party’s elitist brand of governance. There are several factors that account for the PAP’s stunning comeback in 2015. Over the last four years, the government of Prime Minister Lee Hsien Loong – the son of Singapore’s founder, Lee Kuan Yew – has acknowledged public grievances and apologized for some of his government’s previous policies. Seeking to make amends, he has embraced social-welfare spending and taxes for a larger swathe of high income-earners, steering away from the PAP’s unsparing meritocracy and low-tax policies of the previous five decades. Lee’s government responded to public discontent by announcing tax increases on the top 5 percent of earners to fund subsidized health care programs for all Singaporeans and other welfare programs built to strengthen the safety net for elderly and low-paid workers. To address rising living costs, the PAP has taken steps to cool the property market and offset rising housing prices with more subsidies on affordable government housing. On immigration, his government has curbed the influx of skilled foreign talent that have been perceived to be taking jobs from Singaporeans. The annual growth of foreign professionals, managers and executives fell from 45,000 a year to 13,000 in 2014. The PAP has worked to engage the public by addressing the hot-button issues and showing that it is capable of reinventing its policies to suit an era where populist discontent with neoliberalism is no longer politically tenable, and the results have reflected the success of the PAP’s leftward shift. Two major events also contributed to the PAP’s victory: Singapore’s fiftieth anniversary celebrations and the death of the country’s founding father, Lee Kuan Yew, both of which had a strong psychological influence on voters and allowed the PAP to cement its relationship with the electorate in a significant way. Lee led Singapore for over 30 years as the country’s founding prime minister. As the nation’s unrivaled anchor personality, he embodied a sense of pride in Singapore’s accomplishments. Tens and thousands queued to pay their respects to Lee during a national mourning period following his passing in March in a demonstration of mass reverence. His son, Lee Hsien Loong, built his electoral strategy by calling polls a year before they were legally required, thus benefitting from the mood of patriotism engendered by these two momentous events. Global developments also played a role in swaying public opinion in the PAP’s favor: market turbulence in China, the question of US interest rates, and the ongoing political scandal in neighboring Malaysia all culminated during the campaign period, leading many risk-averse and undecided voters who comprise Singapore’s silent majority to back the tried-and-tested PAP government. Lee Hsien Loong has spoken of stepping down in 2020, and the latest round of polls also represents the passing of power from Singapore’s third to fourth generation leaders who will take the reigns after the next election; the newly unveiled cabinet is among the youngest in history and the PAP’s intent to mentor and groom these figures to lead is transparent. The tone and approach of the PAP in these latest elections provide strong indications of the party’s changing character and attitude toward itself. If there were a single figure that represents a reformed PAP, it would be Deputy PM Tharman Shanmugaratnam, whom many – especially in the opposition – hope to see as a successor to Lee Hsien Loong. In contrast to the PAP’s historic aversion to welfarism and adherence to growth-at-all-costs policies, Tharman has advocated the need to strike a balance between redistributive social spending and economic policies; he has respectively distanced himself from the culture of hard-nosed self-reliance promoted by Singapore’s founding generation and has engineered many of the reforms rolled out since 2011. Tharman and his team delivered the most outstanding performance in the polls – securing 79 percent of the vote in the Jurong constituency – slightly higher than the percentage received by the prime minister in his Ang Mo Kio constituency. Stressing the need to continually adapt in the interest of becoming more inclusive, Tharman has shunned the heavy-handed approach to government and declared a shifting away from the top-down approach that is synonymous with the PAP. He has signaled a shift away from traditional meritocracy in favor of building social mobility by investments in early-childhood education. Regardless of whether Tharman Shanmugaratnam becomes the next leader of Singapore, his approach to governance and policy has set the tone for what people want to see from the PAP. It is, however, a shame that many credible and capable opposition candidates and their ideas – such as introducing a minimum wage, trimming the defense budget to fund social policies, and more radical measures to mitigate income inequality – will not have a presence in Parliament. Singapore’s opposition parties cannot ignore the fact that many do not see them as a reliable alternative, largely because of the immense influence on the media exercised by the incumbent. As with previous elections in Singapore, these polls were a referendum on the PAP rather than a chance to elect an alternative government. The PAP is synonymous with the state, and former’s tremendous performance legitimacy ensures that opposition parties will face an uphill challenge for a long time to come. The outcome of 2015’s elections reflect the fact that a majority of Singaporeans are still willing to forego a stronger system of checks and balances afforded by a more representative Parliament in favor of the continued dominance of a PAP that is listening to the public adaptively reforming itself.